On Saturday September 21st my wife and I set up a booth at the Quad City Animal Welfare Center's 11th annual Mutt Strut. The weather was perfect for this event in fact I don't think it could have been any better. We set up our booth with some photos on easels but there was a slight breeze and kept blowing them over so we ditched that plan. Next time I will be more prepared for that. This is the first time we have attended this event as a vendor or participant and I must say they really put together a great event. We've always wanted to bring our own dogs to this event but like a lot of things it slips our mind until after the event. About 8:30 am people started showing up and it was a busy place all morning with dogs of all sizes, colors and personalities. We met so many great dogs and people, and most had a good story of how they rescued their pooch. While we were setting up an artist by the name of Allen Holloway while he was reading my card he seen my name and said "I know some Wangelin's" and it turns out Allen is my second cousin. It really is a small world. Allen paints portraits of dogs and does beautiful work, he had some displayed and I was really impressed. In hind sight I should of taken some photos of his work, I think people would be interested in using the photos I take during their session and have them turned into a painting. Correction I did take a photo of his booth below. This Jack Russell is 10 or 11 years old and has retired from the agility circuit, can't you tell? He was full of energy just like any Terrier and didn't show his age at all. As a Terrier parent I'm always impressed when I see them follow directions and run courses like this. 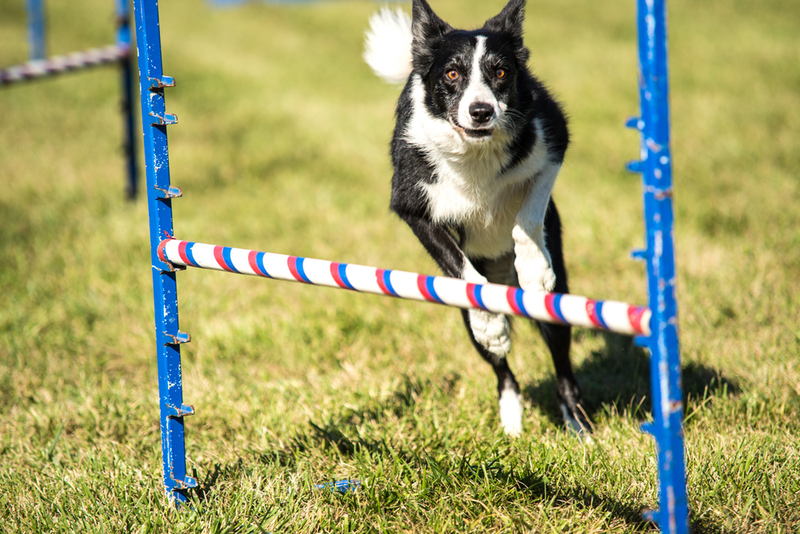 My youngest Alfie I think would be great at agility of flyball if we could get him to concentrate on the sport. I didn't get a lot of information on this guy/girl I really don't remember. But he is 9 years old and still competes. I've been to these types of competitions and the owners and dogs put in a lot of hard work into the sport. The dogs seem to really enjoy the exercise and the completion of a task. As dog owners I feel we neglect are scruffy buddies in the exercise and more importantly the ability to participate in a sport that feeds their minds and bodies plus I'm sure everyone is worn out at the end of day. This guys is available for adoption at QCAWC they are also available on Facebook. I was a little slow getting over to the shelter dogs before they started leading the walk. Of course we had some fancy pooches who got dressed up for the special day. There were lots of great costumes. This beautiful guy was getting all sorts of attention with his friendly attitude. 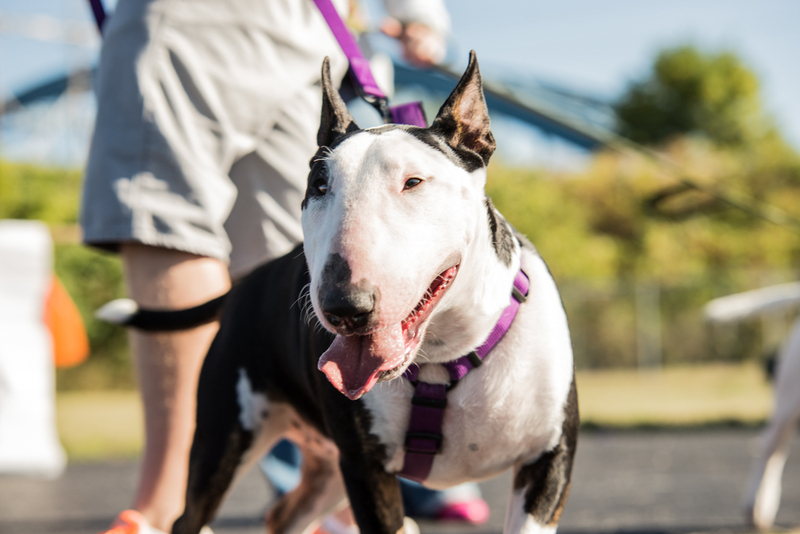 Heres a Bull Terrier, I don't see them very often but it appears i'm not alone when I say its a Spuds Mackenzie dog, that was the first thing I heard people say when they seen him. The Mutt Strut was a very fun event and we were happy to be apart of it. We are already planning on attending next years event. It was great meeting all of the great scruffy's and their owners. Thanks to everyone who came out to support this event and who stopped by our booth to say hi and check out my work.